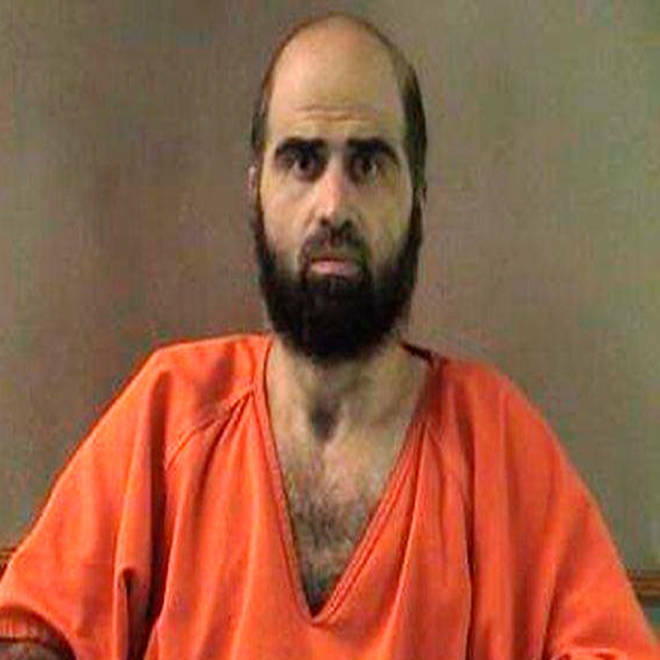 An undated photo of U.S. Army Major Nidal Hasan shows the Fort Hood shooting suspect with a beard he began growing in jail this summer. A judge ordered Thursday that Maj. Nidal Hasan, the Army psychiatrist charged in a 2009 deadly shooting rampage at Fort Hood, must shave or be forcibly shaved before his trial. Judge Col. Gregory Gross had said he would deliver a definitive order this week after a hearing to determine whether Hasan would be allowed to keep his beard, which he started growing while in jail earlier this summer. Gross barred him from appearing in military court, citing the Army’s strict regulations regarding grooming standards. Hasan's attorney, Lt. Col. Kris Poppe, said his client grew the beard as a “deeply sincere” expression of his Islamic faith and because he believed he would die soon. Gross ruled the defense didn't prove that Hasan is growing a beard for sincere religious reasons, the Associated Press reported. Gross also ruled that no further hearings for Hasan's murder trial would take place until all appeals conclude, triggering another delay in court proceedings since defense attorneys plan to appeal. As such, Hasan will not be shaved today. Prior to his court appearances this summer, Hasan, an American-born Muslm, was clean-shaven in all other court proceedings since the 2009 attack. He started growing a beard in June citing freedom of religion laws despite a warning from Gross that his refusal to shave was in violation of Army policy. And since then, Gross has found Hasan in contempt of court at the past six pretrial hearings. In those instances, Hasan was ordered to watch the proceedings outside of the courtroom on a closed-circuit television. Hasan had previously appealed after Gross said he would force Hasan to shave before the trial was slated to begin on August 15. The U.S. Court of Appeals for the Armed Forces ruled last week that his appeal was premature because Gross had not yet issued an order. The court, however, said Hasan would be able to appeal the decision to the Army Court of Criminal Appeals if Gross did order him to shave. Gross was expected to rule Thursday that the Religious Freedom Restoration Act of 1993, which is aimed at preventing laws that substantially burden a person’s free exercise of their religion, does not take precedence over Army regulations designed to maintain order and discipline. Hasan, 41, faces the death penalty if convicted of 13 counts of premeditated murder and 32 counts of attempted premeditated murder for the November 2009 attack. It is the worst mass shooting on a U.S. military base. He is paralyzed from the waist down after being shot by police the day of the rampage. The Army has specific guidelines on forced shaving, the Associated Press reported. If Hasan refuses to shave himself, he would be restrained by five military police officers “with the reasonable force necessary,” and a medical professional would be on hand in case of any injuries. The shaving must be done with electric clippers and must be recorded on camera, according to Army rules.